I got up feeling really good despite the lack of sleep. No pain which is a rarity and very much enjoyed. Headed to work all the way in the dinning room. I was answering phones and really enjoying things. Then THE PHONE CALL CAME. I was laid off effective immediately. I am still all turned upside down. I am trying to organize myself. I have filed for unemployement. I have called the place they contracted to help me find a job. I contacted their benefits department to get a letter to let my dependents on my hubby's coverage. Lots of stuff to think about and make decisions on. That is how I felt for awhile - but now I am starting to get my bearings again. I got up and went to work. It was nice and relaxing - a few calls - not too many alarms. I woke my son up at 7am because he is supposed to go to school for his schedule but he wanted to get there around 8am to meetup with some of his friends. At 8:15 I checked in with him - and woke him up again. Then I went into the bedroom and gave my hubby a big hug and kiss (become a ritual for us) and started moving my stuff back into the bedroom now that he is up. My son left and I didn't even notice him. I didn't sleep well. I was anxious about how the hurricane had effected work. I really should learn to not be so nervous. It was busy with alarms but nothing I couldn't handle. I had a bit of clean up with duplicates because the others had been so slammed with alarms and tech calls. All and all it was a pretty easy day. My son got up and worked on cleaning out his desk by the end of the day he had done a great job. Earlier I had worked on a chores chart and a check list - hopefully this year will be better than last year on the chores issue. The benefit is that I will be home more to make sure he can do them. I got up and woke up my son. I took a shower and went and checked on my son and he still wasn't up. I wasn't feeling good so I made him carry everything out to the minivan. We went to GoodWill Express and donated everything - only took a few minutes. Then we headed off to walmart. No luck in finding a bookshelf that we liked there. We went to Target and found a book case there. Came home. Hubby said he needed more time to sleep so my son and I had a little to eat. I went into our bedroom and played around on my computer checking on our friend and the Hurricane. All was going well but the Hurricane ended up hitting hard and flooding where her old house is. My hubby got up and after a bit we went to The Old Spaghetti Factory and we enjoyed it. I had a drink which knocked me on my keester. I came home and vegged and went in and out of sleep. I woke up with a headache but all of the other pains were diminished a lot. I got up and relaxed. Did some things on the computer and chatted with a friend via email about Hurricane Irene. I am hoping it goes well for her. I went back to bed to be with my hubby and then up again. We just relaxed and I read. It is so nice to have these quiet weekends. Sometimes I really cannot believe that I used to be busy nearly every weekend. After a nice quiet day - my hubby chatted with our friend on the phone and then I went to go pick up my son from his friend's house. I stayed for a bit and talked to them. Wanted to make sure he is not wearing out his welcome and also let them know my son needs to stay home and work on his room tomorrow. we got back and I fell asleep but my son continued to clean his room. Tomorrow we will go to Goodwill express and drop off all of the items that can be donated and then go and try to find a bookshelf for his room. I rolled out of bed and went directly to work. It was an easy day although we were all wondering how the East Coast would fair with the Hurricane Irene starting to hit land soon. At lunch time I dropped off my son at a party (it is nice being home during the day so I can do things like that) and then after I got off work I went to the post office and then headed off to get my nails done. They were really busy so after waiting about 20 min they were able to do my eyebrow wax and my pedicure and I came back around 5:30 to get my nails done. I got home and relaxed. My hubby got home with the pizzas and my son came home not long after. We enjoyed watching the movie Twister and laughing about that. Then he went to a friend's house to spend the night because he was going to be going to a Boy Scout thing later on. I got up this morning and was surprised. The kitchen was spotless, the dinner table looked great - everything was so clean. It was a wonderful start to the day. Work was a bit slower for me than the last couple of days but I sent my hubby an email thanking him for the work he did in the kitchen an he said I needed to thank my son. I couldn't believe it - I walked around the house - DVD's were put away that had been sitting on a table - everything was so neat and orderly - he did this? Without even being asked or guilted? Where are the pods in the back yard this could not possibly be my son!! When he got up around noon - I thanked him a lot. We discussed that he would now work on his closet. he did quite a bit of work and then had to head to his scouts thing. I finished work and finished the paperwork for my son to go back to school. Did a few things on the computer - and did some laundry. I made homemade burritos. I got up and went to work (I still so like that I just groggily wander out to the kitchen table with my stuff to start my day). Today I was kept busier - I did 31 calls. I am defiantly feeling more comfortable about things. I have some techs that I already "know" and so we are able to joke around a bit. I am actually starting to enjoy this new job. After I got off work, my son came home. He and I started going over what could be done next on his room. He decided to tackle his toy box. There was some sadness and memories - but I kept a stiff upper lip so I did not get him emotional. I am so proud of him - for such a long time he would not get rid of anything. He would insist everything had a sentimental value including happy meal toys. But he plodded along and finally just before my hubby got home he was able to finish the toy box. I got up this AM and the first that I had to deal with at work - for just over 2 hours was the site that was flooding us with alarms - at one point there were over 500 alarms in 10 min. After that though it calmed down and I was able to just take calls and handle the occasional alarm. As I was getting off of work - my son left for a friend's house. I chatted with my mom and discussed music with a friend - when my hubby got off work I checked in with my son and he was staying at his friends for dinner so hubby and I had enchildas from our favorite place. We relaxed and then he talked to our friend and I did some work on the computer. I checked in with my son and he is going to spend the night at his friend's house. Just as long as he comes back tomorrow and starts really working on cleaning his room. I woke up about 10 min earlier then intended - I was really anxious about work. So I got up and logged in and started checking things. I was doing the best I could - the lady who started training me came back from vacation and she told me a simple statement that really calmed me down - "You can only answer one call at a time" This is so cool - my other jobs I always answered multiple lines and often remote sessions - this will be less stressful. That really calmed me down. I answered about 19 calls today - I am getting better - at the end of the day though one site started flooding us with alarms - like 500 in 30 min. I stayed late to kind of clean up as much as I could - they said it was going to go on all night and a tech would work on it in the AM. Another nice and relaxing day. My hubby and I watched more bull riding and really enjoyed discussing many of the aspects about it. I spent a huge amount of the day reading a book that I love - it is really long - nearly 1500 pages and now I am about 500 pages in. Finally my son called us to pick him up - so my hubby picked him up and got us some fast food on the way home. We sat and ate and my son told us about his camping trip and how he is doing. It was really great hearing about everything. Then I told him to take a shower - and he did. We relaxed and then headed to bed. I am still kind of anxious about my job - I look forward to getting more comfortable with it. I made banana nut muffins (from a mix) and caught up on a few computer things and once the pain and muscle stiffness subsided - I got back in bed and cuddled with my hubby and got up around 11:30am again. I used to feel so lazy and worthless for sleeping late but I am getting better about it. It helps to have the house already clean so I don't feel like I should have been cleaning house. My hubby got up not long after I did the 2nd time. We laughed and ate Banana nut muffins. He played with our parrot - making a tunnel on the dining room table. She is so funny going through the tunnel. She gets all puffy and acts like the tunnel is evil. hand and my laptop. Hubby put her on her perch. I got up and "went" to work. As usual something about my accounts weren't working right. I wasn't getting any calls even when I should have. So my boss contacted an engineer and after about an hour fooling around with things we were able to get me in the queue and start taking calls. At lunch time I took my son to his friend's house so he could leave for his camping trip. When I got back home and grabbed my Subway sandwich I noticed it was my son's and he had mine. I finally got a hold of the friend's parent who told me he was on the way back right now to switch sandwiches. I am glad he realized it before he left. I actually took some calls - still struggling to keep up but I know I will get better as time goes on. As soon as I was off work and shutting down my computer... my son called again - this time he forgot his permission slip. LOL this is a boyscout camp - you would think he would be prepared. I get up and "go" to work. A minor alarm has a comment of a "Trap has been received" In the description it said DIGITAL LINE FAILURE - listed as MINOR. The guy mentoring me calls and says he is surprise I closed it without calling I told him 1. The customer said only Major and Environmental Alarms - this is minor. 2. A trap never clears so it will never have a clear (ie power failed - power restored) He asked me why a trap does not clear and I had to tell him it is a blip in the data - the data flow is monitored and if there is a spike - or lack of data for even a split second the "trap" is received. It will never clear because it is more of an event - you get multiple traps when it keeps happening and there are problems and traps stop being received when all is ok. He said he never knew this. Really - working on this stuff and they aren't told the meanings or they don't ask - wow. connected the 2 systems - and now they have an answer to why some tickets were missing. The nice part about getting up to go to work now is I get up 20 minutes before I have to "be" at work. I get up - go to the bathroom - put on a slide over the head dress or long night gown and pick up the laptop and my stuff and head to the dining room. 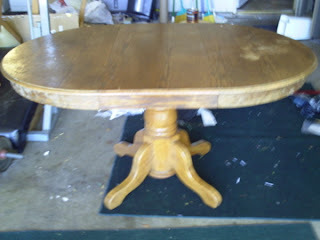 Oh here is what my refinished dining room table and brand new chairs look like - I will also put the before pictures of the dining room table. It takes about 3 or 4 trips to bring everything - but it works. And by 6am I am remotely logged into work and monitoring alarms and such. I always let my boss know I am there and ask if there is anything else I can do. Today I started feeling a bit better. I started to make plans for the coming week and decided that there were things I could do to make myself feel better like getting a wireless headset. So I wouldn't be stuck tied to 3 feet of my laptop. I can feel the depression lifting. I am still sad but not that sad and I have hope. I feel like I can breathe again and I am able to really enjoy reading today. Other than that - I took it really easy today so as to not put me back in a bad state. I am looking forward to doing more work and making this work. Hubby and I spent quality time together and were able to really talk about some things. I am pleased that he didn't get worse with me being so depressed. We really are lucky to have each other. It really should have been a good day - and it was on the outside - just I seemed to be so depressed. I couldn't break out of the mood. I did a little bit of reading. My hubby probably was also feeling depressed as he slept a lot of the day. We did relax and talk. It was nice having a quiet day but I just felt like I was on the brink of tears all day. I hate this feeling - I struggled all day - I am not super depressed but just so emotionally tired - it's not like I want to die - just that I want to sleep all day and cry all day BUT I hate crying so I stuffed my tears and didn't cry. We did have fun watching his parrot try to decide if a tunnel he made was safe enough to go through - it was fun to watch. So my first real day working. I got up and sent my boss and email letting him know I was ready. He sent out an email to everyone that I would be doing alarms and the person that was supposed to be doing alarms would be my backup and the person I ask questions to. The first 2.5 hours - 2 alarms - both reporting something came back up - 10 seconds each of work - geez. Then things got a bit more interesting - probably a total of 10 alarms. I was getting the hang of it. Still struggling with the soft phone but making progress. All in all not a bad day - just being anxious wears me out. I got up and emailed my boss first thing to let him know what else I needed to be able to do the job. He also let me know of another program I would need. I downloaded (it took a couple of hours) one program and installed it. Then he got someone to get me to connect to the Iris server and get that installed. Cool now between PeopleSoft and Iris I can mostly do the start of my new job. Now I had someone use webex to control my computer and install soft phone - it is clunky for me and I am still having a hard time - but I will get there. By the end of the work day I had everything I needed to work my first full day tomorrow! YEA!! Progress. Then I moped around - still having issues from my talk with my daughter yesterday and still on the verge of tears. I hate this. I want to feel good about things. Oh well. I got up early. I was able to remote in on my new laptop and email what was left to do. My soon to be boss told me what else he would want me to have and we started asking for the different permissions for things. Then I got my son up and we went to his psychiatrist appointment. All is good right now - he is in a good mood - he doesn't need medications but we know where we will start if he slides again into depression during the school year. I got to admit the iphone is kind of handy - while he was at the appointment - I was able to respond to emails to continue getting the access I need. I dropped him off at the train station and he easily made the train. I went back home to work. I now had to try getting access into a couple of programs. I got PeopleSoft to work but still didn't have access to download Iris. We tried a few things and then decided to pick it up tomorrow. My son came home - and worked on some more stuff. He left for a few hours to get his shirt finished for the scout meeting. I picked up my laptop that afternoon and started working on getting the basics down. I am able to log in and get email. Still working on everything else but making progress. Then I got a phone call from my daughter's therapist - my daughter wants to come home for the weekend - I am glad the therapist understands because I pretty much laughed at that idea. My daughter cannot even be nice to me - like I would want her to come home to visit. Anyway we talked about things and scheduled a therapy session for Monday of next week. She told me that my daughter is trying to get out of consequences and she will tell my daughter no for me. So bleary eyed, I get up as I usually do to send an email to my future boss and my current boss on the status. Only a few days until I get my laptop - still trying to get a corrected account to be setup for one main application and so forth. Today I got a few hours of training from one of my future co-workers and I also had a conference call with my group of co-workers. Progress I guess. Hopefully by the end of the week I will be ready to work. I got an email a little bit later on and it turns out my laptop will be ready tomorrow! Yea! I sent my daughter's therapist an email early on that I would not be able to make it to therapy - it is kind of a double issue - I want to get up and running with work and I really am not ready for this next therapy session because my daughter is being a pain and I am not emotionally ready to handle it face to face yet. So my son worked on his room and then headed to a friend's house for a bit because he could get a shirt and some patches for scouts from a friend. He came back and continued to work on his room. Just another relaxing day although there were some issues trying to get my son to understand that he must start paying more attention to the things that will go on. I will need to go to a scout meeting on Tuesday that he will get a few awards. My daughter called and she was rude and obnoxious. She just doesn't understand that if you want people to work with you - you have to be respectful and nice. I am so tired of her issues. Some days I just want to give up. Then I get it together and find another way to try again. I got up and worked on cleaning up the house a bit. Got some things done. My son finally got up and started working on cleaning his room. For me and my hubby it was a pretty lazy day. My son actually made progress on cleaning his room. I have been a bit down in the dumps so just resting. Reading a little and trying to get myself out of this funk. For family pizza movie night - I had pizza left over from the night before but my hubby got himself and my son Papa Murphy's pizza. We then watched Fight Club - which was very intriguing. I liked it although it was a bit disturbing. We chatted for awhile and then went to bed. It was a pretty nice and quiet day. My last day AGAIN here at Roseville. This will probably be it. I came in to work today. Tired and remembering why I was looking forward to working at home. It was pretty quiet not a lot to do. I did all of the ops. Answered the phone when it rang and offered to help with small stuff. There was a problem that had a lot of issues stemming from it but because of my distanced feel - it didn't feel stressful to me. I simply helped whenever I could. I noticed some issues but was told it is not a problem - though as I was leaving I was told it was a problem (too bad they got rid of so many good people who would have fixed it the first time) and they were working on it again. As I left I smirked to myself - I do know what the heck I am doing - too bad no one wanted to listen - at least I don't have to deal with that anymore. I got up early and went to Roseville. Wow - all I can say is maybe I don't miss it as much as I thought. I got in and it was crazy - my accounts didn't work - I asked the night shift person to leave their computer unlocked so I could still work. Finally, I got most things running. It was pretty quiet - weird - got to talk to some of my friends. It is a strange feeling being there but not really there. I stayed a bit late finishing a call - and then headed home to get my son for therapy. I got up and did some computer work and started baking cinnamon struessel muffins - then I woke up my son. I finished up baking the muffins and then went back to bed for a bit. My hubby left and then the phone rang. I will be working at the Roseville facility I used to work at on Thursday and Friday because one of my co-worker's family members died. So sad - makes me hope I don't have to face anymore death for awhile. My son came back after awhile and we went to several places (pet store to get bird treats, sporting good store to get him a Leatherman, gloves and water shoes, and Safeway for his special ice-cream). We were done in just about an hour. I had about 1.5 hours before therapy with my daughter. I checked my email and got a few things done and then headed out for the hour drive to go to therapy for my daughter. I got up. I cleaned up a few things around the house and after hubby left for work I decided I would see if I could put together the chairs. The first two were a bit hard to figure out from the directions but after I figured them out - I looked for a hex bit that would fit in a screw driver and once I found that it was easy and quick to put the rest of them together. 6 Chairs in all. It looks really good. The only thing I could not do was to actually screw the side screws through the wood. After that I relaxed, read and watched tv. I talked to my son and he said he would be home for dinner and when my hubby got off work he said the idea I had for homemade burritos was fine. So I got everything setup for them. When my hubby got home he liked the chairs and was proud of me for knowing where my limits were and put the wood screws in. We ate dinner and then put felt pads on the feet of the chairs - now they move around much better and won't ding up the floors. I got up and cleaned up the house a bit. Got most of my chores done and then woke my son up. We went and dropped off a letter at the post office for my daughter and then headed to pick up the new dining room chairs. We got the chairs no problem and my son agreed to help me do the grocery shopping. First we stopped at a shoe place to see if there were any river walking shoes or slippers - there weren't but the lady was really nice. So then we went shopping. It had been awhile so it ran $250 to get everything we needed. We got home - my son nicely brought in the groceries - took out the old dining room table that had been put in the living room and brought the chairs in (they are in boxes and need to be assembled).